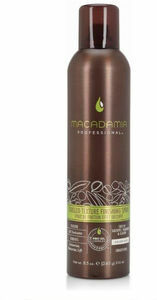 Macadamia Professional Tousled Texture Finishing Spray is a dry finishing spray that adds multi-dimensional texture to boosts fullness and creates volume. This versatile formula is great for longer layered styles, loose braided styles, short texturized looks and everything in between. Light hold with a natural finish.